A Debate as stated by Wikipedia is "a formal method of interactive and position representational argument. It has factual accuracy as well as some emotional appeal to audience which are important elements of the art of persuasion, in debating, one side often prevails over the other side by presenting superior "context" and/or framework of the issue." I watched the Vice Presidential debate last night and I heard factual, logical arguments, but they were only coming from one side of the fence. Umm excuse me, Mrs. Palin, we come to debates to answer the questions that are asked not to tell the world what you want to tell them. There are important issues that need to be addressed that Mrs. Palin glossed over. Yes, Obama voted 94 times for bills to increase taxes...on those people who make over 250,000 dollars, lets' not be hoodwinked. Drilling in Alaska....10 years to gain any reward from it, by the way Obama drives a hybrid, since Palin wants to talk about walking the walk. 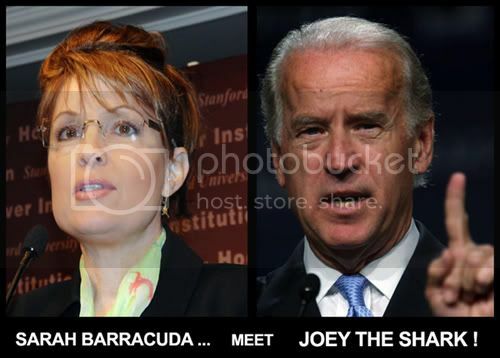 What policies did we hear about education as far as the Mc/Cain/Palin ticket? Is the 600 rebate that we got, the same tax relief the McCain/Palin ticket is talking about? Do you want to give up your insurance plan for a 5,000 credit? Do you know the cost of healthcare. That 5,000 dollars wouldn't cover your pregnancy or your wifes' pregnancy for that matter. This war in Iraq is taking lives unecessarily, its' putting us in debt and it is weakening our infrastructure here at home. I remember a Professor in one of my History classes telling us that the great empires failed because they expanded so far beyond their borders that there central government became weak. This allowed other empires to attack and win while they insisted on conquering and spreading their "ideals". Sounds familiar. The point is this, Sarah Palin is not the person I want to take over this country, if God forbid, McCain passed away.